The Turner family are based in Gloucestershire, Dad enjoys his long distance running and climbing, Mum mostly does her running but does circuit training once a week and is looking to use the Olympic rings to do back rows and to develop her upper body strength. The daughter aged 8 loves her climbing, she has been climbing the tree in the garden with a rope attached but has been asking for monkey bars for a while. The son aged 12, is coming into his teenage years and started to want more body definition, wanting to build on his ‘guns’ as young boys do and like every young boy, he really wanted a pull up bar. The previous equipment in the garden was an old swing which was being disposed off. They were adding a swing to the new Xorbars set up. 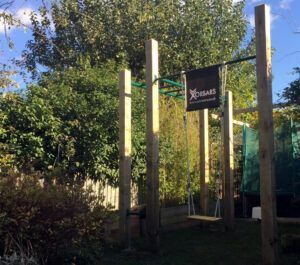 The family wanted something that would fit into the space at the end of the garden next to the existing trampoline, this way it wouldn’t impose on the rest of the garden. The monkey bar was installed at the height 2.40 meters, which is the general height that most people opt for. This meant that Dad being 5ft 11 had the height set so that he had to do a little jump to reach the monkey bars. The 8 year old daughter tried out the monkey bar and easily got up and off the equipment smoothly and safely she can also jump down from the full height bar. There was a small narrow covered passage way from the front of the house to the rear garden which meant that help was required to carry the 12ft posts to ensure that no damage occurred. Andrew was happy to assist in carrying the posts with the Xorbars installer. The duration of the installation took 1 day. After discussing different training methods/moves with the customer, they are now considering extending the gym next year. 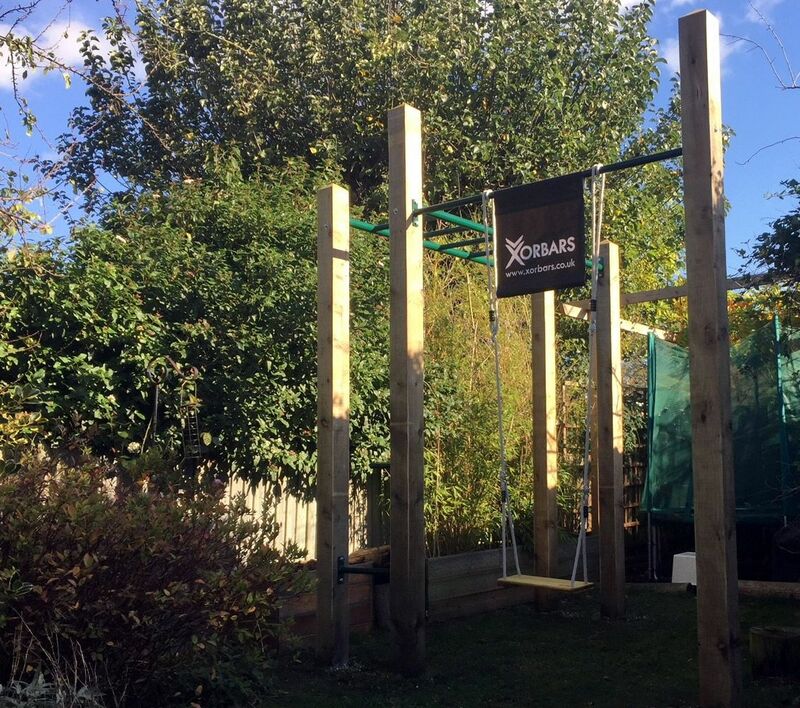 Mum and dad were extremely pleased that it is easy to add on other bars so this will grow with the family and their training requirements. Dip bars are one really nice addition which can be easily incorporated into this set up by adding them to the end of the monkey bars. The posts have been installed so that that the pull up bar can be raised at a later date to accommodate Olympic rings. Foot bars can be added to the bottom of the posts so that the bar can still be reached for standard pull ups. Communications before the installation were prompt and professional. On the day, James arrived precisely on time, he talked to us about our needs and made sure that he fully understand what we wanted out of the installation, and then he set to work in the most efficient and organised manner one could imagine. During the installation, he came up with ideas and proposals for altering the height and location of certain bars, all of which made complete sense. And at the end of the day, he tidied away and left no mess whatsoever. We have been left with a fabulous set up that has been receiving daily use from all of us, small and large!